KIEV, Ukraine — The Ukrainian military on Monday appeared to be readying a long-awaited major assault on the rebel stronghold of Donetsk, warning civilians to leave as troops tightened their ring around the city amid heavy fighting. 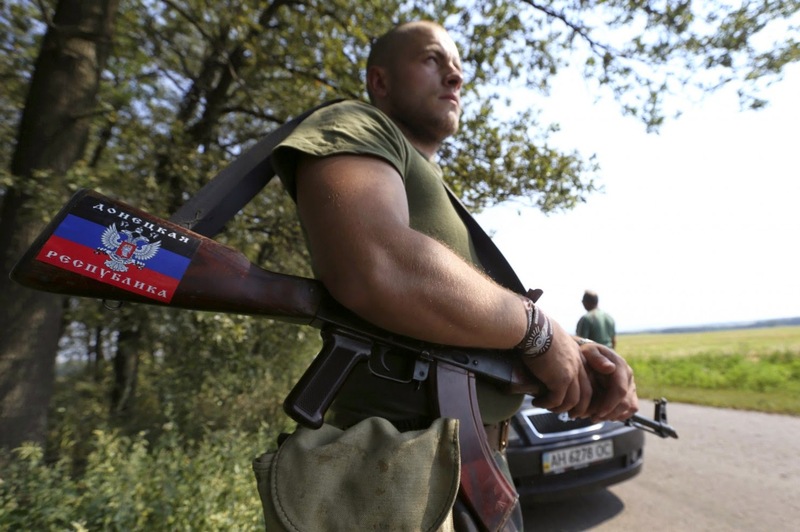 A pro-Russian separatist guards a checkpoint near the Ukrainian village of Rozsypne in the Donetsk region Monday. The Ukrainian government appeared to be readying an assault on Donetsk, which is held by separatists. Extra evacuation corridors were set up for cars bearing white flags, said Andriy Lysenko, a military spokesman. Lysenko also announced that troops had taken the town of Yasynuvata, home to a key railway control center between Donetsk and Luhansk. Intense fighting was reported Monday in the Donetsk suburb of Marinka. Members of a volunteer militia called the Azov battalion posted photos on Facebook purporting to show them advancing on Donetsk with the Shakhtarsk battalion, but mapping technology suggests that the photos were taken in Marinka. Residents intent on remaining in Donetsk crowded grocery stores to stock up, but the streets were otherwise empty. Two performing dolphins at an entertainment complex were transferred to a facility in the city of Kharkiv. In a sign of Russia’s intense focus on the developments, its Foreign Ministry on Monday accused Ukraine of moving Tochka-U ballistic missile systems and Smerch and Uragan rocket launchers toward Donetsk, implying that they may soon be used against the densely populated regional capital. U.S. officials, in turn, have said that Russia is shipping similar heavy-rocket systems to rebels over the border, which Moscow denies. Ukraine has denied possessing ballistic missiles, saying they were destroyed in the 1990s. In recent days, there have been increasing calls in Moscow for the Kremlin to step up support for the rebels in Ukraine as they continue to lose territory to a slow-moving but relentless military advance. Ukraine and the West have expressed alarm over an apparent Russian buildup along the border. On Monday, the Russian air force announced military exercises involving more than 100 aircraft, among them bombers, fighter jets and helicopters. The Interfax news agency reported that the exercises will include missile-firing practice. There also were indications that not everything was going Ukraine’s way on the battlefield. Russian officials said hundreds of Ukrainian soldiers had crossed into Russia overnight Sunday, though 180 were said to have returned Monday. The ITAR-TASS news agency said many were from the 72nd Mechanized Brigade, which is positioned at the border and has experienced intense artillery and mortar fire. It quoted the brigade commander as saying that the troops were exhausted after going two weeks without much ammunition, food or fuel. Ukrainian military officials confirmed that some soldiers had crossed into Russia. But they did not shed light on the possible motivations or say whether the troops are expected to return to Ukraine. Meanwhile, shooting near the site of the Malaysia Airlines Flight 17 crash caused a Dutch-led team of experts to delay its work Monday. After waiting more than four hours, the 100-member team headed to one of two sites in its search for human remains and possessions. The delay caused the experts to forgo a visit to the second site. They found only personal items, no body parts, during their search.